It’s no medical mystery that the most effective way to treat Alzheimer’s disease is early and aggressively. But promising new research out of Washington University in St. Louis, Missouri, is offering increased hope for earlier detection of the disease. 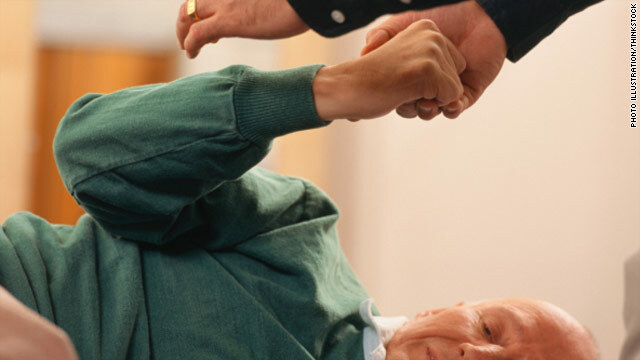 Falls, it turns out, are more common among individuals with the earliest signs of Alzheimer’s. Researchers at the Knight Alzheimer’s Disease Research Center presented their findings Sunday at the 2011 Alzheimer’s Association International Conference in Paris. In some instances – according to Maria Carrillo, senior director of medical and scientific relations for the Alzheimer’s Association, so-called silent biological changes in the brain may take place a decade or more before the outward symptoms begin to manifest. An estimated 5.4 million Americans are currently living with Alzheimer’s disease. It’s the sixth-leading cause of death in the United States, the only one of the top ten causes of death that can’t be prevented, cured, or slowed. “We know that the medicine that we currently have works best if given very early,” says Dr. Sam Gandy, professor of psychology and neurology at Mount Sinai Medical Center. “All the trials we’re doing with new medications target very early stages of the disease. We want to stop the pathology.” Which is why it’s of the utmost importance that the disease be detected as early as possible. The eight-month study followed 125 cognitively healthy older adults – with and without preclinical Alzheimer’s – who were already enrolled in other studies at ARDC. Each participant was asked to keep a journal of how many times he or she fell over the course of the study (a fall was constituted by “unintentional movement to the floor.”) Additionally, all participants had PET scans analyzed to determine their level of Pittsburgh compound B, or PiB, a substance used in PET scans that can indicate the presence of beta-amyloid plaques, a sign of Alzheimer’s development in the brain. Researchers found twice the risk of falls for people with higher levels of PiB on their scan. The bottom line: A fall by an older adult who is usually steady on his feet may signal a need for diagnostic evaluation. “At the end of the day,” says Petersen, “if you go through all these things and there’s nothing else going on, it could be a degenerative disease of the brain.” In which case, you’ll be glad you flagged the symptoms earlier rather than later. Why do you people bother to read about these studies and worse, to comment on them? Spare us all your attempts at "humor" and go blow. People like you pop up like toadstools after a shower, making disdainful comments about every research finding. Falls, grey hair, liver spots, I'm sure they're all correlated with alzheimer's and any number of age-related diseases. I hope they hang the "genius at work" sign at the Research Center. People don't have to be old to get Alzheimer's, and old age doesn't mean someone will get Alzheimer's. People can get full-blown Alzheimer's in their 40s and 50s, and others can live into their 90s and 100s without ever getting it. Daisy missed the point of your post. She probably has alzheimer's. actuallyDaisyhas i right. . Joe on the other hand is making leaps of logic that defy description. My husband is in his mid 50's and being tested for this awful disease. I've seen this man go from a vibrant, healthy, active man to someone who can't recall the conversation we had together 20 minutes before. It's devastating to the family to watch their loved one fade away slowly every single day. His father has had Alzheimer’s for years and hardly recoginzes any of us. I'm terrified of this happening to my husband. He is too. No laughing matter – at least not for our family. I have a terrible memory and asked my Neurologist to test me for Alzheimer’s disease and he said that while there are some tests that can suggest the possibility of a diagnosis of Alzheimer's disease, nothing is 100% certain and there are no specific tests that confirm with any level of certainty whether you have Alzheimer's disease or not. The best that Doctors can do is say whether Alzheimer's may be the cause of your symptoms based on the symptoms you have. I agree. The key word here, folks, is "may." What have they established??? Why comment if you truly do not understand? i'm a 'faller' and have been since i was 30. i'm clumsy. stopped taking diltiazem which was causing my ankles to swell and my feet to hurt. still might be pre-disposed to this dreaded disease even though it doesn't run in my family but i'm hoping i'm not. Not much science behind this story. Bottom line is that if you fall down, go and have a few thousand dollars worth of tests run. There might be a chance they find something where you can spend a few thousand more dollars to find out later they were wrong. Alzheimer's Disease is "the only one of the top ten causes of death that can’t be prevented, cured, or slowed." If it cannot be prevented, cured, or slowed, then why does the article say that "early and aggressive treatment" is the "most effective" way to deal with it? It sounds like someone is trying to make a buck selling snake oil again. Yes,my thoughts exactly. I think it CAN be slowed in its progression to full blown Altzheimers by the use of drugs such as Aricept. My elderly neighbour told me that he was diagnosed with Altzheimers,and they were giving him Aricept.He died a few years ago,and I'm not sure how much the drug slowed the disease down.I always remember him as being bright,and a very friendly chap. Aricpet doesn't cure, prevent or slow alzheimer's. I have something similar called frontal lobe dementia and I'm on Aricept. It's not slowing anything down, but it does help me with my memory. But the disease is still chugging away as fast as ever. The only benefit to knowing is the ablity to get one's affairs in order and if one desires, find a way to end the misery befoire nautre takes its cruel and costly course. My friend's husband had his life extended by getting an implanted pacemaker; so whereas ne might have passed before the dementia manifested severely, this brilliant engineer is now bognizant of virtually nothing, but his heart beats on. And his doctors sleep well at night for this, well-compensated too, since his insurance is superb. How kind it would be for a senior with Alzheimer's to be able to end this by choicebefore the dementia took absolutely everything. Alexander is right. Please revise the lede of this posting, which falsely indicates that there is an effective treatment for Alzheimer's disease. This is a significant error that needs to be corrected. The third paragraph has it right. Thanks. Learn to use reply. Your post had no reason to be its own thread. They used to call it "hardening of the arteries" back in the day before they actually came up with a name. many deceases had other names or descriptions! like "the vapors" fainting or hot flashes. "sugar" or now diabetes. Alzheimers isn't new at all just has a medical name. i hope they find a cure for it. It is hard to watch a loved one slowly disappear. you look into their eyes and they aren't there any more, they look at you but you can't see the love as before. It is harder than a sudden death. They were right about it being "hardening of the arteries" with some people.They suffer from what's called transient ischemic attacks,or small strokes that gradually injure the brain.There are many causes of dementia,and Altzheimers is probably the deadliest. I think you are thinking of atherosclerosis...that would me hardening of the arteries. Obviously, none of you live with the constant threat of a loved one falling.Not just tripping over the carpet,but losing conciousness and going completely out for a matter of seconds to a matter of minutes, dealing with the consequences of these falls, having your life turned upside down.Living with a wheelchair,traveling with a chair and requiring someone to be always with the person to make sure if the fall is serious enough, to call 911. We would gladly spend thousands MORE if we could find anything that would help give us any more time as a normal family again. Live in someone else's shoes before you presume to condem the medical community for Research. They're forgetting to add God into the equation here when they say there is no treatment for alzheimers or cure or prevention. When one prays, MIRACLES can truly happen! It is when a dis-ease is known to have no man-made cure that one should turn to God for the answer! He Created man and He can heal man! When the sky looks the bleakest and the darkest, look to the light of Jesus. He can perform the miracles than man cannot! Look to him rather than accept a man-made forecast of gloom and doom when it can turn out much better through prayer to God. I hope you're joking or trolling, because otherwise you've got some mental disorders yourself. Believing in non-existent things beyond childhood is not a safe thing. Not believing in the Guy In The Sky, POODLES, could lead to complications in your life later on. Try some Lecithin x2 daily...Wal-mart pharmacy MAY be lowest price. Take with Multi, extra C 1k, E 200 or better. Just like the Guy In The Sky, it won't hurt to try. unless you are allergic or hyper-sensitive to any of the vitamins named. I'm no doctor, nor do I espouse any religion over another, I just care enough to wish all who read this post: Good Health. Hogwash. If there's a God, then why does he or she burden us with such terrible diseases? Jo, probebly because he/she is not a very nice God. The history of manking is littered with terrible disases, accidents, Acts of God To believe in a bieing that would allow innocent infants to be roasted alinve or who whould wipe out en entire town to get rid of a few Gay people or would cause volcanos/earthquakes/floods is to be pretty sure that if there is a God it is not friendly to mankind. I fell last week off a short ladder and broke my arm above the elbow. I am also suffering with extreme tightness in the neck and shoulder areas and am pretty sore all over. I know why I was on the ladder but I don't remember falling. I'm 72 years old. I am a candidate for the researchers. Try googling clinicaltrials.gov and type in the search terms you want – alzheimers, locations you can get to, etc., and it will show you studies for which you might be eligible. I wonder though. If someone with Alz falls in the forest where noone can hear him...will he remember it? sorry naysayers, but my dad was diagnosed at 63 and placed on aricept immediately, he is now almost 85 and still recognizes us, tools around in a wheelchair w/ his feet, and smiles and laughs at appropriate times. he lives in a special care unit of a nursing home, but he still has quality of life. the aricept has significantly slowed the progression of the disease in him , unlike his other three siblings who also had it ~ that are not with us anymore. yes, four of eight siblings in one family! so, if falling is an early sign, i urge all of you to pay attention to it! I know all of us cousins are making ourselves very aware. We had a similar experience with my father, who was diagnosed early and placed on Aricept. With the early diagnosis, he was able to help plan for the future and to reassure us that eventual placement in a special care unit would be OK. He eventually did need placement, but he really did have many good years (10+) after the diagnosis, spending time with his grandchildren, gardening and following his favorite sports teams. My father's sister, who did not have the same early treatment, had a much faster progression of the disease. Was the difference in disease progression just a random event? We'll never know, but I am on the bandwagon for early diagnosis and treatment! So I'm 72, still tavel the world teaching; just made my first film that will be shown in several up-coming film festivals; working on the second. My third book in six years comes out next spring. This winter I slipped and caught myself going up a cement staircase during a rainsrorm when my shoe hit a patch of slimey leaves. I'll make an appointment with my local neurologist tomorow for a battery of tests to see if in ten years I'll begin to develop signs of Alzheimers. Thank god for the internet. If the disease can't be cured or even slowed, then why is it important to diagnose it early and treat it aggressively? That makes no sense. To ease the burden on caretakers, and to give the patient the best quality of life for as long as possible before they lose their minds and start rubbing their nose on the kitchen table like my grandpa does. I'm assuming you don't have anyone in your life who's had this, so of course you wouldn't understand. Why does some moron always feel the need to make some asinine comment on every article about a research study? If all you are going to do is get on here and "yawn" or complain that the research is a waste of money or that it's a "duh" moment for medical research, just shut up already and go elsewhere. Falls may be an indicator. So are getting lost, forgetting things, losing stuff, and a myriad of other things. Focusing on falls in particular seems rather limiting. As suggested in this article falls may not always be a sign of Alzheimer's. In my case I would fall and pass out, which happened a few times. In testing it was found it was my carotid artery that was blocked. I was operated on and that was the problem. But to add further my sister-in-law was falling and they couldn't give her any diagnosis. She ended up with dementia and passed away last month. My mother died from Alzheimer's three months ago. I gave her all the possible medications and took good care of her trying to stop the inevitable. In the end, she had 11 agonizing years of a terrible disease. Today, I kind of feel guilty and wonder what would have happend if she would not have taken all those things. Probably, she would have died sooner and suffer less. I am sorry but after seeing what she went through I don't want to go through that myself. Unless we find a cure, we should not extend a disease full of complications like neumonia, colds, urinary infections, contractures, vomit, diarreah, blod clots, skin infections... do you want more? And what is worse: NOT BEING YOURSELF ANYMORE!!!!! in my case falls indicate late stage alcoholism. If you wrote an article about life we'd all reach enilhgtenenmt.